Relaxing with a cool beverage on a hot day can be incredibly refreshing. 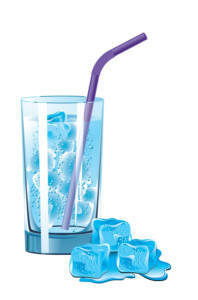 The small, melty ice cubes clinking around at the bottom of your glass quickly cool you down and quench your thirst. Chewing the ice that’s keeping your beverage cool is even better, right? If you wear braces, then you probably already know that chewing ice is a no-no. Luckily for patients straightening their teeth with Invisalign in Asheville, the clear aligners can easily be slipped off to enjoy an occasional crunch. If you find yourself absently – and happily – chewing away at a couple of ice cubes after you’ve finished a drink, you’re not alone. There are many people who enjoy chewing ice not just incidentally, but as a matter of habit. According to our knowledgeable oral health team, however, it’s a habit many people have. And – though it may be enjoyable to you – it can certainly be annoying to the people around you. The need to chew ice can also be a sign of a more serious medical condition, so be sure to check with your doctor if you have concerns. It’s not so great for your teeth either, which is why the American Dental Association recommends avoiding persistent ice chewing to prevent tooth injuries such as cracked or chipped teeth, enamel damage, or gum injuries. Your teeth are simply not built for the wear and tear caused by eating bags or trays of ice every day and can wreak havoc on your orthodontic work. You can continue to enjoy them, although those type of sugary treats should be limited, too! The damage to braces is usually caused by chomping on the hunks of ice rattling around in the bottom of your glass, or worse, ice cubes straight from the freezer. What’s an Ice-Chewer to Do? If you have severe ice cravings, you need to find out why. It’s important to seek proper diagnosis and treatment. Any behavior that is not done in moderation can cause problems and chewing ice is no exception. Additionally, if you’re having jaw pain or toothaches, let your oral healthcare provider know. They may be able to help you avoid serious damage to your teeth and jaw. We suggest that you try to let the ice dissolve in your mouth rather than chewing. Or, you could try sucking on semi-melted ice slivers instead of cubes. For patients who have Invisalign, slip off your aligners and soothe your craving for a hard, icy crunch by eating cold carrots, celery sticks or apples. These crunchy hard foods should still be avoided with braces. Have Questions About Braces or Invisalign in Asheville? If chewing on ice is becoming a problem in your life, or if you have any other questions on this topic, feel free to contact our friendly office. Our experienced doctor may be able to help you with this issue by preventing or repairing any damage to your teeth.